The post British Triathlon – Independent Non-Executive Director – Finance appeared first on NEDworks. The post Team Fostering – Non-Executive Director appeared first on NEDworks. Senior officials at the Financial Reporting Council (FRC) may believe Scrooge has stepped off the pages of A Christmas Carol. In his recent oh-so-close-to-festivities report, Sir John Kingman said, “Bah, humbug!” to the UK’s governance watchdog and recommended the regulator for financial reporting, audit and actuaries be shut down. It must be said however, Sir John was being less like Charles Dickens’ most famous miser, and more like a rational soul calling time on an institution that has long since lost its lustre with many close observers of corporate governance. 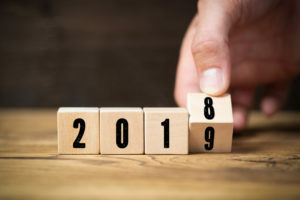 But the demise of the FRC is just one in many significant events that marked 2018 as a big year for governance: yet another corporate failure triggered the end of the FRC; audit quality and the audit market was placed under the microscope and found wanting; the UK got a new governance code designed for “long-term” value; executive pay continued to be a national debate; the murder of Saudi Arabian journalist Jamal Khashoggi indicated CEOs could be agents for change; and the a major report highlighted the role companies and investors have to play in speeding up the battle against climate change. The year’s events left no room for complacency and mean non-executives have had little time to settle. And to add to it all they’ve had to ensure they are cyber literate and prepared for Brexit, whatever the final outcome of negotiations might be. Though the year closes with uncertainty over Brexit, there are now no unknowns about the future of the FRC. The body is destined to be wound up and replaced by a new organisation: The Audit, Reporting and Governance Authority. The move comes on the recommendation of the Kingman review appointed earlier in the year by government to look at whether the FRC was still relevant. The review said it had done a good job on governance but in other areas was found wanting. It noted the FRC stood accused of moving too slowly, being too close to the organisations it regulates and being “too timid”. Things had to change. Reforms are on the way elsewhere too after the Competion and Markets Authority (CMA) issued its own report on the audit market. Here the CMA advised audit and non audit services of the big firms be split into separating operating units to minimuse conflicts of interest. It also wants closer scrutiny of the audit committees and their auditor appointments. Both sets of reforms stem directly from the collapse at the end of last year of Construction giant Carillion. A major contractor to government, the company’s collapse led to Parlimentary enquiries that ended in intense criticism of both the FRC and Carillion’s auditor KPMG. Indeed the FRC has an unfinished inquiry probing the Carillion audit, though a report from MPs accused the firm of failing to exercise professional scepticism towards company’s accounting judgements. KPMG’s public image took a further beating a routine check prompted the regulator to conclude that audit quality at the firm had fallen. Meanwhile the FRC also made headlines for producing a brand new governance code for the UK. There was criticism for failing to insist on companies including employees on their boards, but there was also praise for the way it integrated sustainability. Debate over executive pay in the UK did not let up through the year and will, perhaps, intensify in 2019. Investors have issued warnings and threats. There were small measures in the governance code but otherwise concern remains broadly where it was. Of course, the UK’s current bout of soul searching over remuneration results largely from the huge £100m bonus received by Jeff Fairburn, chief executive of housebuilder Persimmon. The ensuing public outcry prompted the resignation of the company and remuneration committee chairs in December last year. Fairburn even agreed a reduced bonus. But the sheer scale of the payout remained an obstacle. The end for Fairburn came in November when he walked away from a BBC interview when asked about his pay. Footage went viral on the internet and soon after Fairburn was asked to turn is his shovel for the sake of the company. Other individuals caused waves with their own behaviour, or their alleged behaviour. After much public concern about the succession of Sir Martin Sorrell at WPP, the CEO stepped down in April amid a board investigation into allegations about his personal conduct. He was not alone in having behaviour questioned. Elon Musk, CEO of Tesla, was forced to give up the company chairmanship after regulators in the US investigated a tweet he sent claiming to have a buyer to take Tesla private. Musk caused further concern when he appeared on a YouTube show apparently smoking cannabis. Shareholders were not best pleased, though newspapers had a field day. Elsewhere Ted Baker founder Ray Kelvin demonstrated the power of the #MeToo movement and made the news when it emerged that employees had jointly signed a letter complaining about his habit of “hugging” colleagues and workers. Kelvin was eventually compelled to take a leave of absence. Facebook, Uber, Google+ and British Airways saw some of the biggest cybersecurity breaches of the year, proving once again that customer data is not as safe as we might like to think. The issue is now well and truly on the boardroom agenda with company leaders everywhere dreading the midnight call that announces criminals have breached fire walls to steal customer data. The issue is perhaps best exemplified by new measures from regulators which in July saw the Bank of England demand explanations from financial firms on how they plan for a cyber attack. The issue is unlikely to go away any time soon. Investors are concerned. Writing for Board Agenda, Fiona Reynolds of UN Principles for Responsible Investment, says: “Boards need to work closely with senior management to escalate the message across the organisation that security is everyone’s problem. Though IT issues do not end there. The resigning in September of TSB bank’s chief executive Paul Pester over an IT meltdown in the Spring underlined the accountable leaders have for tech, even if they are not experts. In the age of the internet, artificial intelligence and robotics, cyber security is now an ever- present boardroom concern. Climate change is a global concern and also very much a feature of boardroom discussion; or should be. The issue has resulted in much speculation about the role of companies in battling global warming and how they integrate “sustainability”. When the Intergovernmental Panel on Climate Change (IPCC) issued its report in October it included dire warnings about the need to accelerate climate change policies at government and company level. But there were concerns. It added a warning. In a passage about the ability of business to invest in the right technologies, the report said persuading businesses to invest properly is a problem if their main concern remains pleasing shareholders. It explained that a lack of clarity about the position of regulatory regimes and the quality of low emission innovations, as well as uncertainty over future revenues because of the price of fossil fuels, amount to an obstacle. “This inhibits low-emission investments by corporations functioning under a ‘shareholder value business regime’”, the report says. Board Agenda has conducted its own research, in association with Mazars and INSEAD, to reveal how boards have integrated sustainability thinking into their discussions and policies. The good news is that company leaders recognise its importance. The bad news is that they appear less convinced about the information and policies they require to tackle the issue. Perhaps the most horrifying event this year to touch on governance concerns was the murder of Jamal Khashoggi. Chief executives of many global companies believed they should take action with dozens withdrawing from an investment conference in Riyadh, the so-called “Davos in the Desert”. Indeed the boycott appeared to underline the growing phenomenon of “CEO activists”, especially in the area of human rights. And that was only a fraction of governance developments in 2018. Next year promises equally busy. Have a restful Christmas. The year placed governance on the front of newspapers and at the heart of major debates. If anything, however, it reemphasised the importance of companies in tackling societal issues whether it be human rights, data privacy, climate change or scoial inequality. Any board member in denial about that would be well adivised to seek alternative employment. The post 2018: A year in governance appeared first on Board Agenda. A wide range of post-crisis regulatory reforms has created a more complex governance framework for banks when it comes to managing their local subsidiaries. In the past decade, regulators have implemented measures at both a global and local level, aimed at protecting depositors and taxpayers, and ensuring local subsidiaries are adequately capitalised to avoid contagion in the event of another banking crisis. As a result, banks now have home and host country regulation to contend with. For example in the UK, the Financial Conduct Authority has forced lenders to separate their retail operations by erecting a ring-fenced institution with its own board and management team. Meanwhile, in the US, Europe’s systemically important banks have been forced to create intermediate holding companies—independently capitalised subsidiaries that are subject to rigorous stress tests from their local regulator, the US Federal Reserve. While regulation has become more local, big banks continue to operate as global entities as they serve the increasingly international needs of all their clients. It is still down to the group board to ensure they have effective oversight and risk management to ensure their far-flung subsidiaries have the right level of local expertise while continuing to manage capital, resources and products on a global basis. With the general direction of travel by regulators towards increasing levels of subsidiary independence, this has inevitably led to the proliferation of subsidiary boards and management structures that in some cases rival their parent companies for heft and complexity. Taken to its logical conclusion, this could hamper the ability of the parent to exercise effective control over the activities and strategic direction of their own subsidiaries. On the other hand, holding too much control at central group level can create a one-size-fits-all approach without taking into account the unique specificities of each subsidiary, and create a culture of complacency where the board of a subsidiary does not take sufficient responsibility for its own actions. Given these often competing developments—more local regulation on the one hand, and more globally connected banks on the other—there is an inherent tension between the home jurisdiction of the parent and the host jurisdiction where its subsidiaries are located. “Home regulators typically want banking groups to be able to exercise more parent control over subsidiaries while host regulators typically want to deal with sufficiently independent subsidiaries, able to constructively challenge decisions that may be in the interest of the wider group but not necessarily of the specific subsidiary,” says Cliff Ekwem, a senior analyst at governance advisory firm Nestor Advisors. Therefore, banks face a complicated and costly mixture of global and legal entity management and controls that consume significant board and senior management time as they figure out the best structure and composition for the boards of their subsidiaries. The board must ensure that risk systems are robust and uniform, and have clear oversight of issues such as auditing, technology, selection, culture, whistleblowing and fraud. Despite the stricter regulatory environment and clear guidelines, serious breaches and lapses still occur. The uncovering of money laundering and fraud this year at Danske Bank’s Estonia branch highlighted how much work needs to be done at board level to ensure oversight of compliance of bank subsidiaries in different countries. From the outset, parent companies must rely on extensive control mechanisms to ensure that the group has an effective subsidiary governance programme in place to assure itself that all companies within the group have the same values, ethics, controls and processes in place as at the parent board level, known as “downstream governance”. Downstream governance is assured through the subsidiary board, whose task it is to enable, complement and lead. At the same time, the local board should act in an independent and objective manner from the parent board and focus on safeguarding the corporate interests of the subsidiary. “The composition of subsidiary boards should reflect an adequate balance of promoting downstream guidance and acting independently from the parent. Finding the right board composition for each subsidiary will depend on its intended function and strategic importance,” says Lisa Andersson, head of research at Aktis, a leading provider of bank governance data. Research by Aktis (Fig. 1)on Europe’s 14 biggest banks, as defined by the Financial Stability Board as globally systemically important (G-SIBs), revealed that subsidiary boards typically comprise six key profiles: subsidiary non-executive directors, subsidiary executives, parent/other subsidiary executives, joint company non-executive directors, joint company executives and employee representations. 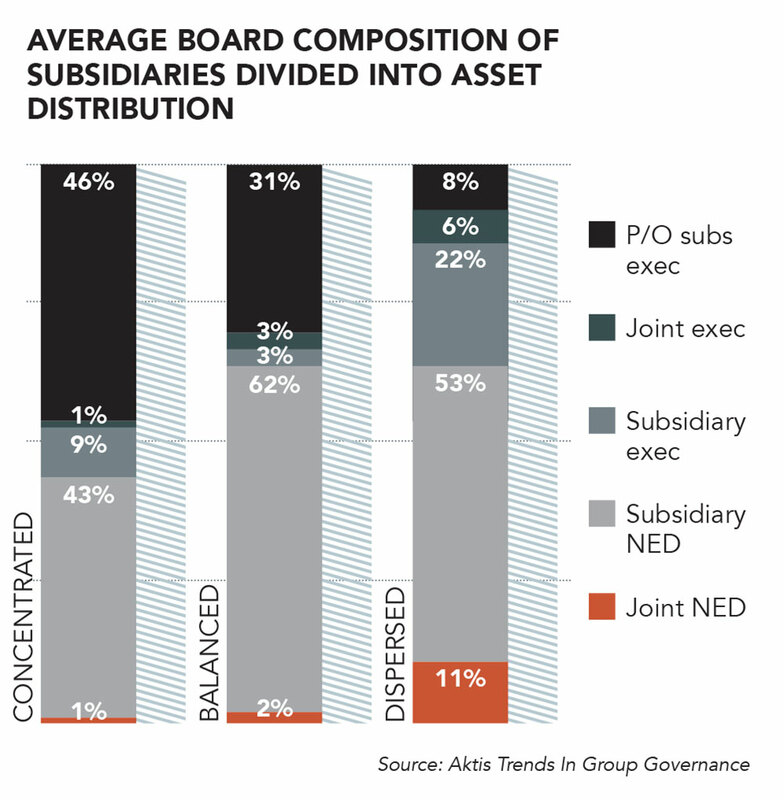 According to Aktis, the largest proportion of directors are classified as subsidiary NEDs, who are typically seen to bring the independent viewpoint needed to differentiate the parent board from the subsidiary board. The second biggest group of directors were NEDs, who held executive positions elsewhere in the group (P/O subs exec). As these directors serve as executives elsewhere in the group, they will typically be seen to provide “downstream governance” to the subsidiary board. Subsidiary executives, who typically oversee the day-to-day operations of the subsidiary, represent 14% of directors. Finally, the presence of joint NEDs and execs who serve on both the subsidiary board and the parent/management board may indicate a subsidiary of strategic importance to the group. Analysis of subsidiary chairs by Aktis revealed that almost half are subsidiary NEDs, while more than a third are executives of the parent or other subsidiaries. When it comes to the independence of the chair, there is a big discrepancy between the subsidiary, where 22% were considered independent, and the parent, where almost two-thirds were considered to be independent. “The data indicates that parent companies opt for a chair with some connection to the parent entity, which is not unusual given the parent company is typically the ultimate owner of the subsidiary,” says Andersson. This theme plays out across individual board members. According to Aktis (Fig.2), 68% of directors on parent boards are classified as independent, compared with only 29% at the subsidiary level, well below the traditional 50% minimum independence threshold sought in many jurisdictions. Then there is the added complication that not all bank subsidiaries are created equally and banks give greater priority to some over others. For higher priority subsidiaries parents may endeavour to put similar governance practices in place as the parent company, with outside directors, scheduled board meetings, formal committees and even annual board evaluations. For these subsidiaries, the parent company may want to have common directors on both the parent and subsidiary board or have joint meetings between the parent and subsidiary board/committees to ensure a clear line of sight and accountability between both entities. By contrast for lower priority subsidiaries it may be the case that their boards are made up entirely of insiders, with no formal committees. The higher priority the subsidiary, the more material it is likely to be to the parent in the event of a breach of risk management or other controls. In seeking to understand what defines a high or low-priority bank subsidiary, Aktis defined it using two indicators—consolidated versus unconsolidated total assets; and the size of subsidiaries’ assets relative to group assets. Depending on how assets are distributed, banks are categorised as “concentrated” where they have more than 55% of their assets in the parent entity; “balanced” when they have between 25% to 55%; or “dispersed” where less than 20% of assets are held within the parent company. The more dispersed the asset classification, the higher priority the subsidiaries are. According to the Aktis, half of European G-SIBs fell into this category, requiring more executives on the ground to manage the day-to-day operations of the company. “The data showed that companies defined as being dispersed have the highest proportionality of subsidiary executives, joint NEDs and joint executives,” says Andersson. By contrast, centralised structures place less emphasis on the subsidiary, and the composition of the board is drawn from an internal pool of candidates where independence is not necessarily important. Since the scandal, Danske says it has strengthened governance and oversight with the introduction of a new pan-Baltic management. It has also improved its systems and instigated firm-wide anti-money laundering training. But, perhaps more importantly, it has implemented risk management and compliance in performance agreements of all members of the executive board and senior managers. Creating local board structures at subsidiary level is not necessarily the only tool that group boards have at their disposal. Group boards can ensure that the group management team develops strong functional lines with a real group-wide remit, particularly for key control functions such as internal audit, risk and compliance. 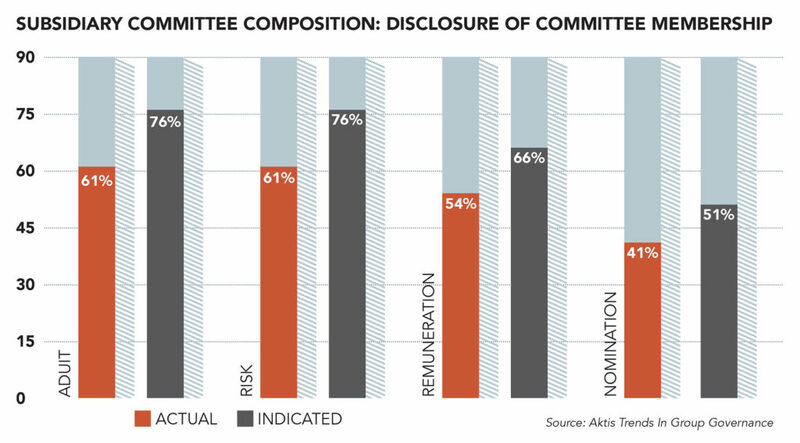 According to Aktis, audit and risk committees (Fig. 3) are the most important in relation to banking subsidiaries. Seventy-six percent of banks surveyed had both an audit and risk committee at subsidiary level, while 66% had a remuneration committee at local level and 51% had no nomination committee. A possible explanation for this is that the appointment and recruitment process would be handled by the parent company rather than the subsidiary. The research revealed a high concentration of subsidiary NEDs on the audit and risk committees, reflecting the need for independence on these committees. With so many conflicting priorities and in some cases divergence between host and home regulation, the solution recommended by Aktis is to introduce a group governance policy (GGP). But GGPs are not always formalised, and very little exists in the way of formal documentation. According to Aktis, Spain’s Banco Santander is the only big European bank that discloses a GGP to the general public. Banks must spend time reflecting on the equation of how to balance parent control and subsidiary independence, and ensuring that their agreed solution is clearly documented in a policy, or set of group policies, that all internal stakeholders understand. This article was produced in association with Aktis and Nestor Advisors, which are supporters of Board Agenda. The post A healthy balance for parent banks appeared first on Board Agenda. The post Architecture and Design Scotland – Board Members appeared first on NEDworks. The post Citizens Advice Wigan Borough – Trustee appeared first on NEDworks. The post Funding London – Non-Executive Directors appeared first on NEDworks.